A really long time ago I wrote Ghosts of Climates Past. I’ve read a lot of papers on the ice ages and inter-glacials but never got to the point of being able to write anything coherent. This post is my attempt to get myself back into gear – after a long time being too busy to write any articles. The often-accepted hypothesis that the physical laws governing the behavior of an atmosphere determine a unique climate is examined critically. 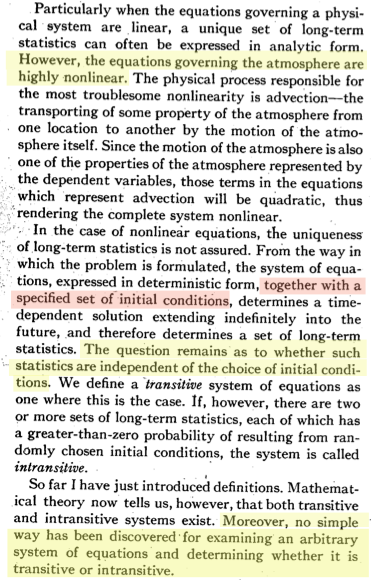 It is noted that there are some physical systems (transitive systems) whose statistics taken over inﬁnite time intervals are uniquely determined by the governing laws and the environmental conditions, and other systems (intransitive systems) where this is not the case. There are also certain transitive systems (almost intransitive systems) whose statistics taken over very long but finite intervals differ considerably from one such interval to another. The possibility that long-term climatic changes may result from the almost-intransitivity of the atmosphere rather than from environmental changes is suggested. 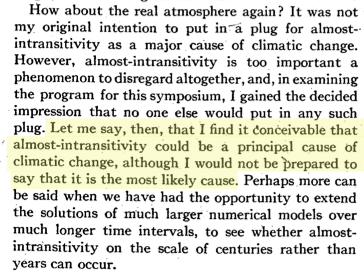 Here Lorenz describes transitive systems – that is, starting conditions do not determine the future state of the climate. 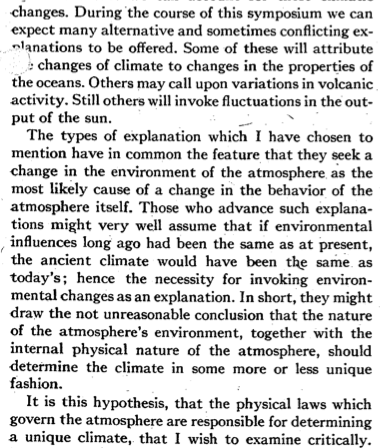 Instead, the physics and the “outside influences” or forcings (such as the solar radiation incident on the planet) determine the future climate. Here Lorenz introduces the well-known concept of “chaotic systems” where different initial conditions result in different long term results. (Note that there can be chaotic systems where different initial conditions produce different time-series results but the same statistical results over a period of time – so the term intransitive is a more restrictive term, see the paper for more details). Well, interesting stuff from the eminent Lorenz. That is, a few coupled systems, working together can produce profound shifts in the Earth’s climate with periods like 80,000 years. 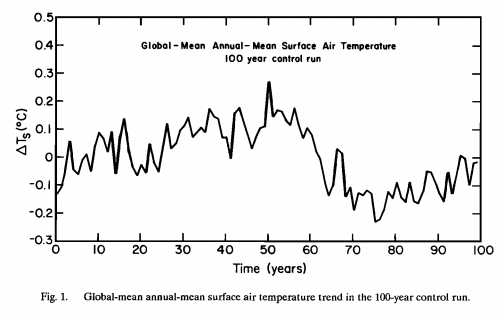 The variation of the global-mean annual-mean surface air temperature during the 100-year control run is shown in Figure 1. The global mean temperature at the end of the run is very similar to that at the beginning, but there is substantial unforced variability on all time scales that can be examined, that is, up to decadal time scales. Note that an unforced change in global temperature of about 0.4°C (0.3°C, if the curve is smoothed with a 5-year running mean) occurred in one 20-year period (years 50-70). The standard deviation about the 100-year mean is 0.11°C. This unforced variability of global temperature in the model is only slightly smaller than the observed variability of global surface air temperature in the past century, as discussed in section 5. The conclusion that unforced (and unpredictable) climate variability may account for a large portion of climate change has been stressed by many researchers; for example, Lorenz , Hasselmann  and Robock . 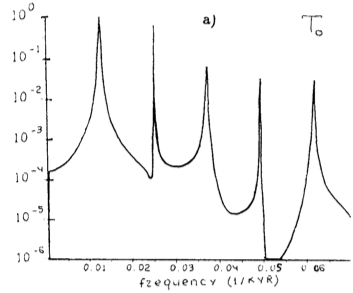 In later articles we will look at some of the theories of Milankovitch cycles. Confusingly, many different theories, mostly inconsistent with each other, all go by the same name. It’s great so see you back. 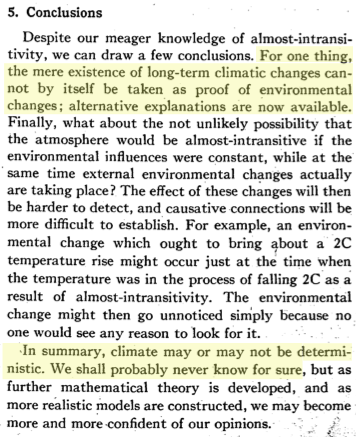 Has model development been independent of knowledge of climate trends? 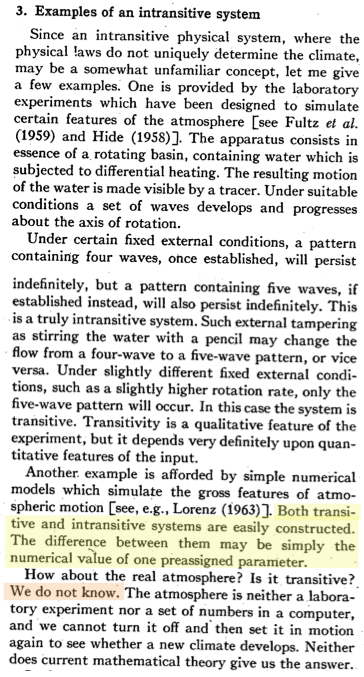 Lorenz didn’t publish anything further on this subject. Skeptics have noted that higher climate sensitivity is always paired with higher sensitivity to aerosols and lower climate sensitivity with lower sensitivity to aerosols in the IPCCs models. Judith Curry has noted that different forcings were used by different models when hindcasting 20th-century warming for attribution studies in AR4. Studies with perturbed physics ensembles suggest that the stepwise methods used to tune models are unlikely to result in a globally-optimum set of parameters and that an optimum set of parameters can’t be found within an ensemble when their output is compared to a wide variety of observations. Yes but the PETM. And deglaciation under orbital forcing. GHGs are efficacious climate forcings. Paleoclimate behaviour is difficult to reconcile with an equilibrium sensitivity to 2 x CO2 lower than ~2C. The current generation is standing on the shoulders of giants. The climate SKEPTIC James Hansen ?